One of my least favorite things to add to my page when I'm making a digital scrapbook page is the title. I love alphas but placing all the letters, arranging, resizing, shadowing, etc...It just seems to take too long. I have a few techniques I use when I'm in a hurry to make a title and I don't feel like fussing with digital scrapbook alphas. I already wrote a tutorial on one of the ways I make my own titles here but that's not the only technique I use. Let me show you a few more. Here's a page where I didn't really make a title. I thought the little tag that said forever would work perfectly on this page. I also added another tab to include just a little bit of journaling and another one to add the date. That's all this page needed. 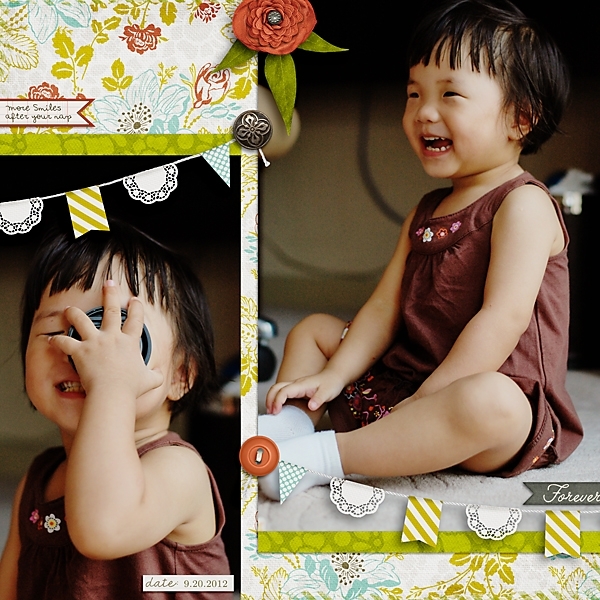 Big Photo Fun Templates by Scrapping with Liz and Vintage Sprout by the Scrap Orchard Designers. Sometimes I just use the included text title layer (always included on my templates) and type in my title and change the font to fit the page. On this particular page I blended the text in with the paper just a bit to make it looked like it was stamped. Check out this tutorial for an easy way to blend your text into your paper. 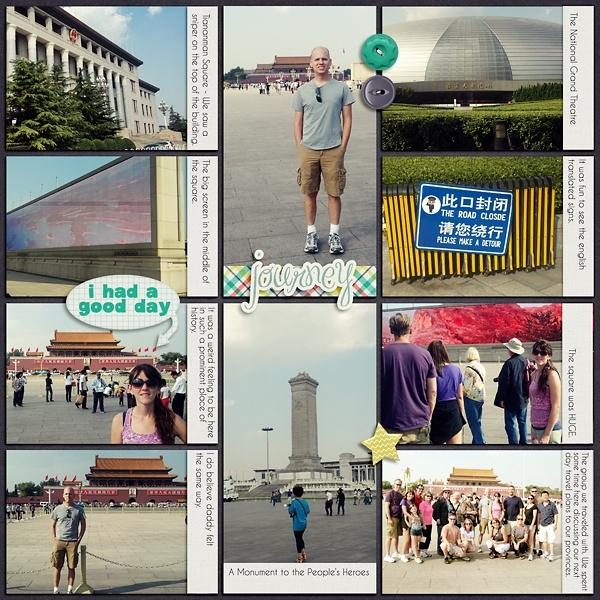 On this page, I used a purchased layer style. Layer styles are great because you can add cool effects text and clipping masks that are already on your page. I like Mommyish for layer styles. I usually tweak them a little to get just the look I want. If you need help installing layer styles check out this video tutorial from SuzyQ Scraps and while you are at it be sure to download the free kit. It comes with a set of drop shadow styles (which would be similar to how you would use other styles) and you can practice installing them and using them. On this page, I just simply added a title to the tab on the top. Here I just added another title with a simple font on a tag that came with the kit. Here I used a word art that was included in the kit. 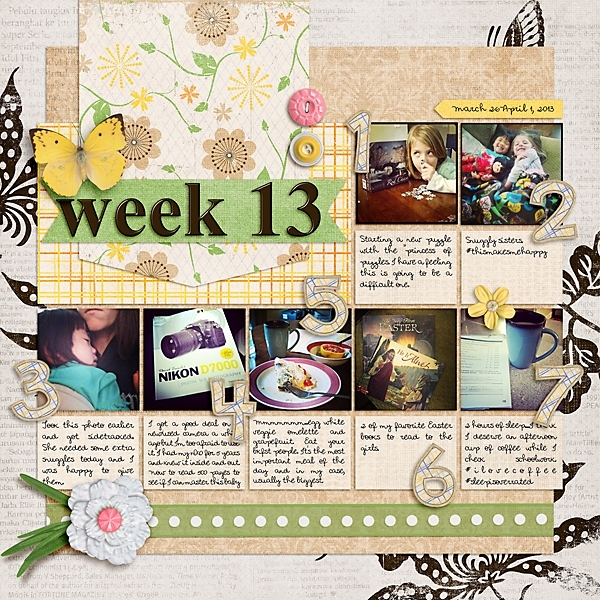 Freebie Template on my Facebook Page and Best Day Ever by Amanda Heimann and Word Art from Great Escape by WMSquared. And I think it's safe to say that sometimes you just don't need a title. Sometimes the photos speak for themselves. In this case, I just added a bit of journaling. 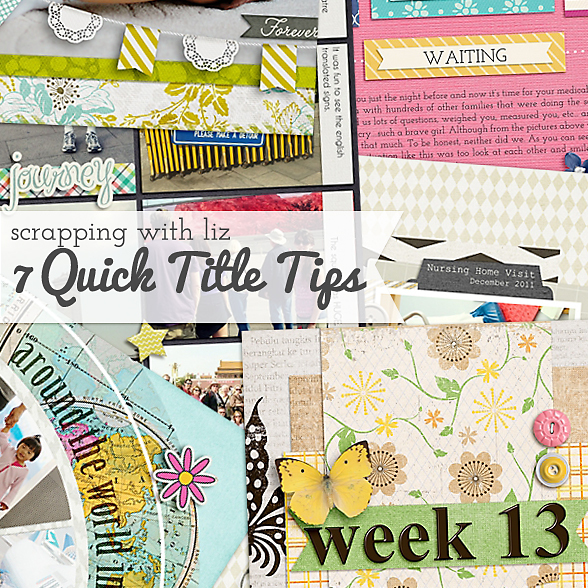 Fancy Templates by Scrapping with Liz and Beauty from Within by Megan Turnidge. 2. Use journal bits that are included in kits. 4. Use Layer styles on a font. Check out this video tutorial by SuzyQ. 5. Add a title to a tag. 6. Use already made word art. 7. Let the photo speak for themselves. Hope that will help you speed up your scrapping a little bit. If you have more tuts and content to share, you are invited to come join the forum and post them!